We’d love your help. Let us know what’s wrong with this preview of He Loves Me Healthy, He Loves Me Not by Renee Dyer. To ask other readers questions about He Loves Me Healthy, He Loves Me Not, please sign up. my grandson has chari and he is so cute and awesome in his own world he hardly smiles and he is just a treasur from god and for you to totally understand in his eyes this book can help so many parents to understand i love to read and this is a total blessing to me thank you from the bottom of my heart ? Chiari Malformation: it's a term I'd never heard of and now is one I won't forget. This book is one of those that changed my outlook on life. I picked this book up on a whim. The synopsis appealed to me and it's been incredibly enlightening about chronic illness, those who suffer and those who bear witness. Told from dual points of view: Brenna, the sufferer, and her husband, the witness. The narration from both points of view really made this book hit home. It lays out all their struggles and frustrations, feelings of inadequacies, and difficulties in communication. Their love and devotion to one another. This is an amazing love story. It's love in defiance of difficult circumstances. Love as affirmation of life in the shadow of death. This book was very difficult to read, not because I didn’t like it, but because the subject matter is not an easy one. Taken from her own personal experience, Renee has given us the story of a life threatening illness and one woman’s struggle to keep going despite the hardships this brings to her life. The book is about Brenna, a very happy and confident woman who loves life and isn’t afraid of anything. The story follows Brenna from the moment she meets her husband, Nick, until the moment she fin This book was very difficult to read, not because I didn’t like it, but because the subject matter is not an easy one. The book is about Brenna, a very happy and confident woman who loves life and isn’t afraid of anything. The story follows Brenna from the moment she meets her husband, Nick, until the moment she finds out her condition, when she’s diagnosed with Chiari, and how she handles the news. This is a very emotional story and you can feel the author’s despair as you’re reading. You can feel the pain and fear of the unknown. But she is surrounded by a family and friends who love her unconditionally and that makes things bearable, to some degree. I started the book and had to stop several times throughout; trying to assimilate what was going on and then continue. I have to say that I love Nick. He stood by his wife regardless of the bad days she had when she lashed out at everyone, when he felt like he couldn’t talk to her, and when he just didn’t understand what she was going through. But he loved her and that love allowed him to be strong for her. Brenna is such a strong character and a remarkable woman. Her condition brought her to her knees, literally and figuratively, yet she fought hard, for herself and those around her. It was so difficult to see her struggle when the flare ups took over and the frustration and desperation that gripped her when she couldn’t be there for her baby. To know that she couldn’t move, couldn’t talk, couldn’t hold him. That was the worst. This book is absolutely beautiful in the way it’s written; the message of survival that it gives, and the hope that it brings. I wholly recommend everyone to read it, for the story itself and even more, to learn a little of this horrible illness. This book hit so very close to home for me, as another Chiari sufferer. While our stories are so different, I could relate so very much! Very moving!!! WOW this is a challenging , super emotional read , for many reasons. Having said that it is also a wonderful read if you are able to handle reading about sickness. Normally I would avoid a book knowing the majority of it would be about a struggle with a condition as frustrating and horrific as Chiari can be BUT knowing this author and knowing her struggle with this condition I had to open up and allow myself to learn as much as I could about this condition. Anytime an author can tell a story , m WOW this is a challenging , super emotional read , for many reasons. Having said that it is also a wonderful read if you are able to handle reading about sickness. Normally I would avoid a book knowing the majority of it would be about a struggle with a condition as frustrating and horrific as Chiari can be BUT knowing this author and knowing her struggle with this condition I had to open up and allow myself to learn as much as I could about this condition. Anytime an author can tell a story , make you feel connected and also help you to learn something new about something very real you have to give credit and this story is just that. Is there happiness and joy ?? YES but it is found in the little things and you have to dig deep to be able to appreciate that. This is not just about Brenna's struggle with Chiari it is also about the struggle a serious brain condition can cause a family , a marriage and also everyday normal life. Nothing is simple anymore and everything , even cooking and cleaning becomes a struggle. I can imagine that at some point in all of our lives we have struggled with being sick or hurt , the guilt of not being there for your kids or spouse , the guilt of alienating yourself from friends and loved ones for a short amount of time. Sadly for people suffering this condition and many others in the world they live with this guilt daily because they have to sacrifice these things all the time. Having a dual POV is great , we feel and connect to both Brenna and Nick. We take this journey through Brenna first finding out about her condition to the choices she and her family have to make to attempt her feeling better. Of course these decisions do not always pan out and the outcome of some are just devastating to read about. It was frustrating to know that someone can suffer this much and not have any relief despite the lengths they have gone through to get there. Seeing the love between Nick and Brenna was amazing , seeing them build a family and have faith that it wouldn't always be so bad was phenomenal and being a part of their journey was eye opening and again I loved finding the joy and happiness they were able to provide their kids , each other and enjoy themselves. Renee Dyer is a one-click Author for me. This book is up there with one of the most touching and real love stories I have read. This book is about a woman who struggles with Chiari. It's about a love so strong that you wish for this love yourself. This Author put her soul into this book because it is her soul, it is her life. I applaud Renee for allowing us to walk in her shoes, to feel her pain, her joy, her love. To me, it takes a strong person to share with the world an experience that rocks yo Renee Dyer is a one-click Author for me. This book is up there with one of the most touching and real love stories I have read. I applaud Renee for allowing us to walk in her shoes, to feel her pain, her joy, her love. To me, it takes a strong person to share with the world an experience that rocks you to your very core. Not only that we learn of a love so strong that nothing can break it. I have read a lot of books this year - well over 100. I have read a lot of great books this year - I immediately thought of at least 20 as I wrote that. This book goes in a category of its own. I want to buy this book for everyone close to me and tell them it is required reading. I think I have actually convinced my husband to use a Kindle for the first time because he realizes it is that important to me that he reads it. Then I want to give copies to all of my friends struggling with chronic illnesses, so they can read it, and have all their loved ones read it too. This book is about a woman with Chiari Malformation. I have vaguely heard the term as I have been through hundreds of tests in the last few years, trying to decipher exactly what is causing my body to betray me. While I would definitely give this book the highest recomendation to anyone dealing with this rare disorder on any level, I will take it further and recommend it to everyone dealing with a chronic illness, and also to their partners. I picked this book up on release day based on promotion from another author I like. The synopsis caught my attention, but I had no idea just how much this book would literally change my outlook on life. Seriously. It had that major of an impact on me. I will open myself up here in a way that I rarely do, but for the last 4 years my health has deteriorated to a place I barely recognize myself on my best days. I can't tell you how many doctors and specialists I have seen, let alone how many tests I have been through and how many potential diagnosis have been thrown around. While I still have no answers (and ironically am recovering from another surgery as I read most of this book) this book made me look at the whole of my situation in a new, and much needed, light. What moved me most about this book is the way it is told through the eyes of both the wife, who suffers the condition, and the husband who has stood by thick and thin. After 4 years, it was very easy for me to understand Brenna's struggles and frustrations. My heart hurt for her and her family, and I so understood how she felt that she was letting her husband and kids down. I felt every word devoted to her frustration at her body's betrayal. I felt like someone actually understood when she had days she just didn't want to deal with it, didn't want to talk about it anymore, especially with those closest to her. How she didn't want to give up the few things she still had control over. Those things enough are reason for me to embrace this book and easily give it 5 stars. Then comes what really set this book apart and really made me look at and reconsider so many things in my life. About half of this book is written from the husband's point of view. All of his frustrations and feelings of failure. It really hit home that he is a victim in all of this just as much as she is. It made me look at what my husband is going through with me in a completely new perspective. It definitely will make me pause before I get short with him again, realizing that though he may not be physically suffering the same things I am, it doesn't mean that he isn't just as affected by it as I am. It is opening up long overdue lines of communication between us. I have a new understanding that his frustrations aren't at me, as it is easy to believe when everything else is falling apart, but that he is also frustrated that he can't fix anything or provide any answers either. To me this is an amazing romance, though there is no happily ever after. The dedication through the rough times is perhaps the most romantic gesture of all. We all need to take time to realize this, no matter where our struggles fall on the scale. The perspective I gained from this book has been priceless, and I will be recommending it again and again. 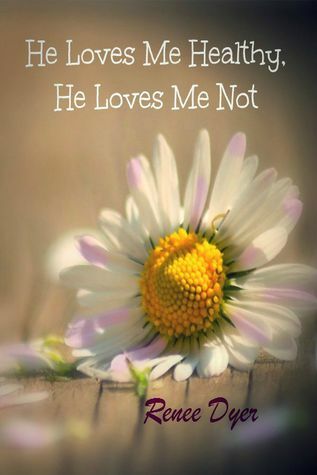 4.5 Stars - He Loves Me Healthy, He Loves Me Not is completely outside the realm of your typical romance. There is nothing about this story that has been romanticized or airbrushed to fit the fairytale. This journey has not been written to make the reader swoon, but it has been written to make the reader feel deeply and irrevocably. This book is real and raw and heartbreakingly honest. As the title suggests, Renee Dyer explores the true strength of Brenna and Nick’s marriage vows as her sudden d 4.5 Stars - He Loves Me Healthy, He Loves Me Not is completely outside the realm of your typical romance. There is nothing about this story that has been romanticized or airbrushed to fit the fairytale. This journey has not been written to make the reader swoon, but it has been written to make the reader feel deeply and irrevocably. This book is real and raw and heartbreakingly honest. As the title suggests, Renee Dyer explores the true strength of Brenna and Nick’s marriage vows as her sudden diagnosis turns their world upside down, forcing them to face the best and worst parts of themselves and their relationship. This book was heartfelt in an undeniable way. Renee Dyer clearly found the words for this book in the depths of her soul, pouring her life and love into Brenna and Nick’s unexpected journey. Renee Dyer’s characters really stole a piece of my heart. Their fears and pain so palpable and genuine that I found myself connecting to them instantly and wishing I could shelter them from their heartache. Nick surprised me completely, his emotional honesty pouring off the pages. His guilt over feeling helpless broke my heart several times over, while his fierce love for Brenna and devastating thoughts of being forced to live without her stole my breath in that way only a beautiful and unconditional love can. Renee Dyer certainly put Nick through the wringer and by the time I reached the end of the book, she had broken and remolded the boy Brenna fell in love with into an unquestionably worthy man who was swoon-worthy in his own right. Brenna simply captivated me. Renee Dyer did a phenomenal job chronicling the mental, physical, and emotional changes this character experienced. From the complete bliss of falling in love to the absolute horror of suffering under the care of negligent and inexperienced doctors, Brenna constantly evolved during her journey. With her endless flux of emotions and unpredictable physical condition, she wasn’t a character you could define or label. Brenna was whatever she needed to be in each moment, fighting for her life or simply enjoying it. This fluidity of character made me feel as if I experienced an entire lifetime inside the pages of Renee’s book, branding me with an appreciation and respect for the bravery, strength, and unparalleled grace of this character. He Loves Me Healthy, He Loves Me Not took me on quite the emotional journey. When Brenna St. James is diagnosed with Chiari Malformation her life. and that of her loving husband, Nick, get flipped upside down. As they learn how to live with this debilitating illness and face many complications, both physically and emotionally, you wonder how this couple could possibly overcome all they face. This is a story of fighting your body, overcoming fear, forgiveness and for me, HOPE. A story of how the He Loves Me Healthy, He Loves Me Not took me on quite the emotional journey. When Brenna St. James is diagnosed with Chiari Malformation her life. and that of her loving husband, Nick, get flipped upside down. As they learn how to live with this debilitating illness and face many complications, both physically and emotionally, you wonder how this couple could possibly overcome all they face. This is a story of fighting your body, overcoming fear, forgiveness and for me, HOPE. A story of how the love of your spouse can give you strength to continue fighting to live life to the fullest, despite your own body or thoughts trying to keep you down. Brenna has her weak moments but her sense of humor shines throughout the entirety of the book, while Nick is her anchor, even as his heart and thoughts shatter around him. This couple... They inspire me, and shw what true, lasting love is really about. I have stated for the record, on more than one occasion, the fact that 5 Stars seems like a low rating for an EPIC book. It's never been more apparent than in the case of He Loves Me Healthy, He Loves Me Not, as 5 Stars will never be enough for this powerful and profound story! Brenna is a happy, strong, confident woman who loves with all she has, and isn't afraid of anything. The story follows her journey of life, from the moment she meets her husband, the moment she's diagnosed with chiari, an I have stated for the record, on more than one occasion, the fact that 5 Stars seems like a low rating for an EPIC book. It's never been more apparent than in the case of He Loves Me Healthy, He Loves Me Not, as 5 Stars will never be enough for this powerful and profound story! Brenna is a happy, strong, confident woman who loves with all she has, and isn't afraid of anything. The story follows her journey of life, from the moment she meets her husband, the moment she's diagnosed with chiari, and the battle they fight. Real struggles of Brenna starting to have doubts if Nick can love the person she is now. She feels the guilt that he even has to go through what she sees as the failures of her body. Will Nick and Brenna get through the uphill battle they face together? What is Chiari? If you would have asked me this question before I read this book, I would have probably said it sounds like a beautiful girl’s name. I had never heard of Chiari until I began reading “He Loves me Healthy, He loves me Not” It took me six days to read this book, six days of hundreds of emotions I felt with every page turned. The condition depicted in this book is very real, and it something that is rare and unknown to many. In this story, we meet Brenna and Nick. Their lives are tur What is Chiari? If you would have asked me this question before I read this book, I would have probably said it sounds like a beautiful girl’s name. I had never heard of Chiari until I began reading “He Loves me Healthy, He loves me Not” It took me six days to read this book, six days of hundreds of emotions I felt with every page turned. The condition depicted in this book is very real, and it something that is rare and unknown to many. In this story, we meet Brenna and Nick. Their lives are turned literally upside down when Brenna receives the diagnosis of Chiari, a rare neurological condition. Their love is tested. Their family is tested. The marriage vows, ‘in sickness and health’ takes on a whole new meaning when it comes to Brenna and Nick, and all they are facing. Brenna, always a strong willed natural born fighter is determined to not allow Chiari to define her, and stop her from living her life. This is not an easy read for the light hearted, but it is one I would HIGHLY RECOMMEND because it is a beautiful testament of a couple’s love and how they fight every single day to hold on to what they have, no matter what life’s challenges have set forth for them. I cried…a lot, but I welcome those tears because this story touched my heart and it made me FEEL many emotions from page one until the end. When I was choosing the books I wanted to review for the month of August, I didn't realize exactly what this book was about. I knew that I wanted to check out this author, so I just signed up without reading the blurb. It wasn't until I started reading it that I realized that this book takes you through a couple's journey through what I now understand is a horrible condition...Chiari. I had to immediately google it before continuing to read. I can't quite explain it, but it was like I could fell When I was choosing the books I wanted to review for the month of August, I didn't realize exactly what this book was about. I knew that I wanted to check out this author, so I just signed up without reading the blurb. It wasn't until I started reading it that I realized that this book takes you through a couple's journey through what I now understand is a horrible condition...Chiari. I had to immediately google it before continuing to read. This book gives you not only Brenna's POV but also Nick's POV. I think that sometimes as a woman it's hard to understand how our spouse feels when we are hurting. This book is not for the faint of heart...it's real and raw and holds nothing back. I love how even through their journey you still get to witness the love that this couple has for each other. He Loves Me Healthy, He Loves Me Not was such a heart wrenching and eye opening story. This story completely makes you step back and look around at your life. Sometimes we may feel down and out, feel as though times are tough. But when you read this book you come to realize that life isn’t really so bad sometimes. No matter what, there are always people out there that are going through something worse. We go through things in life at one point or another that beat us down and we feel as though things will never look up. This story really shows you that no matter what, as long as you stay strong and keep fighting, that life is worth it in the end. We are never guaranteed tomorrow but keep striving for today. And no matter what, always, always keep pushing forward. In general it takes a lot for a person to share their thoughts, their stories, their writing. But it takes a hell of a lot more to really show themselves. It takes a really strong person to show themselves at their absolute worst...at their weakest. So, when you read this book keep that in mind. This is not just a story, this is real life. This is life and life is not always rainbows, hearts, and flowers. Sometimes we may feel down and out, feel as though times are tough. But when you read this book you come to realize that life isn’t really so bad sometimes. No matter what, there are always people out there that are going through something worse. We go through things in life at one point or another that beat us down and we feel as though t He Loves Me Healthy, He Loves Me Not was such a heart wrenching and eye opening story. This story completely makes you step back and look around at your life. This book was so touching to read. Taken from real life experiences that the author has had, this is a story about a couple dealing with an illness and trying to overcome it. I have not heard of Chiari before I read this book. This was a learning experience as well as a heartbreakingly great story. Reading about Brenna’s suffering both physically and emotionally was really hard. I was hurting for her. But I love her strength and determination to get past this. She wasn’t gonna let it bring her down. Her attitude is what I admired the most about her character. Nick was just as great. I loved how he loved her. He was always there for her and doing his best. This illness was just as hard on him-he was suffering emotionally. Reading his thoughts was heartbreaking. But the love that he had for her was the greatest thing. No matter what he was going to survive this with her and that was so moving. Love, Love mean being their unconditionally. Loves means hurting when the person you love hurts. Love means feeling their fears and crying when they cry. Most of all love is being brave when the person you love needs you to be brave for them. That is what this amazing story is about, love, strength, and Bravery. Renee gives us a story that is not only filled with the passion of unyielding love but a story that will teach you and inform you of something that is rarely heard about, Chiari. Chiari i Love, Love mean being their unconditionally. Loves means hurting when the person you love hurts. Love means feeling their fears and crying when they cry. Most of all love is being brave when the person you love needs you to be brave for them. That is what this amazing story is about, love, strength, and Bravery. Renee gives us a story that is not only filled with the passion of unyielding love but a story that will teach you and inform you of something that is rarely heard about, Chiari. Chiari is a condition that is heart breaking to behold much less live with, but this is not a sad story, no. It is a story of determination and strength. Brenna and Nick love each other more than anything and they fight to keep their love strong being their for each other in their time of need. Him holding on to her when she needs him and her shielding him from her pain when necessary. Together they fight Chiari and continue to build on their love for each other. Five Emotional Stars! This is Brenna and Nick's story as she is going through her daily struggles with Chiari and the challenges it brings. Chiari is a serious brain disease and it causes struggles with your activities of daily living but also puts a strain on your personal life. As a person living with Multiple Sclerosis reading this book most definitely hit home, I go through struggles with my ADL's as well as personal struggles daily. Nick and Brenna share so much love with one another and sh Five Emotional Stars! This is Brenna and Nick's story as she is going through her daily struggles with Chiari and the challenges it brings. Chiari is a serious brain disease and it causes struggles with your activities of daily living but also puts a strain on your personal life. As a person living with Multiple Sclerosis reading this book most definitely hit home, I go through struggles with my ADL's as well as personal struggles daily. Nick and Brenna share so much love with one another and share that love with their children. The story is about love, strength, bravery and understanding. At points in the story you will be in tears but, it will make you smile and you will also see her strength shining throughout the book. I thoroughly enjoyed this story and will be looking for more from Ms. Dyer. Highly recommend it! For those who think Chiari is fake...This is your eye opener!!! 5 stars are not enough for this book. I want to thank this author for her writing about this. If you know me, I read a book in less than 2 days. This one I couldn't. With reading this story, I relived the past 6 years of my life. The heartbreak, fear and happiness that people dealing with Chiari go through. To top it all off, most doctors have NO CLUE what this is and most feel you are faking it all. Like I said my story started 6 ye For those who think Chiari is fake...This is your eye opener!!! I was given a copy by the auhtor in exchange for an honest review. I'm not sure if I can give this book the justice it deserves. It was such an emotional and powerful story I had to stop a few times just to take it all in and be able to prepare myself to finishing reading. The author had such a way of writing that you could feel the pain and despair these characters were feeling. Nick was such an amazing guy, he stood by Brenna through out the whole book, even when she was not very nice, he stood I was given a copy by the auhtor in exchange for an honest review. I'm not sure if I can give this book the justice it deserves. It was such an emotional and powerful story I had to stop a few times just to take it all in and be able to prepare myself to finishing reading. The author had such a way of writing that you could feel the pain and despair these characters were feeling. Nick was such an amazing guy, he stood by Brenna through out the whole book, even when she was not very nice, he stood dtrong for both of them. Brenna was a strong woman, even though she was down, she fought hard. I loved the message you get from this book. I definitely recommend this one. I read this book last week and fell in love with the writing, the characters, the story. After I finished it, I found out that someone I had known slightly through Facebook had died in her sleep, more than likely from complications of Chiari. It brought the message of how devastating this condition can possibly be and the effects it has on both parts of the couple. This is no condition to take lightly. I thought the depiction of a couple in crisis was well--written. The resolution was left open-ended, but I can live with that. Their story was left unfinished --we don't know if Brenna's life with Chiari will continue, or if the battle has reached an uneasy truce. I hope that one day Renee will revisit this couple so we can follow them further. This book is a great heart felt touching story. Breena and Nick are amazing couple who have a lot of things tested when Breena is becomes sick. Breena is diagnosed with Chiara. I learned a lot about Chiara reading this story and it did make me want to learn more about it. Breena and Nick goes through a lot of ups and downs. Many of us take the vows "in sickness and in health" during our weddings. What happens when that vow is put to the test? Breena and Nick find out. It's a emotional read. Bree This book is a great heart felt touching story. Breena and Nick are amazing couple who have a lot of things tested when Breena is becomes sick. Breena is diagnosed with Chiara. I learned a lot about Chiara reading this story and it did make me want to learn more about it. Breena and Nick goes through a lot of ups and downs. Many of us take the vows "in sickness and in health" during our weddings. What happens when that vow is put to the test? Breena and Nick find out. It's a emotional read. Breena and Nick are wonderfully written and I couldn't help but fell for the characters. This is one book where I wish I could jump through the pages and gives the characters a hug. One of the best books I've read in a long time. As a fellow Chiari warrior I had high hopes and Mrs Dyer exceeded them. She had me crying before Brenna was even out of the hospital. I relived every emotion I felt from when I was diagnosed up to leaving my daughter with family the night before my surgery. It was like she reached into my head and expressed what I couldn't at the time. I highly recommend this book to anyone who knows someone with Chiari, it may help you understand the daily struggl One of the best books I've read in a long time. As a fellow Chiari warrior I had high hopes and Mrs Dyer exceeded them. She had me crying before Brenna was even out of the hospital. I relived every emotion I felt from when I was diagnosed up to leaving my daughter with family the night before my surgery. It was like she reached into my head and expressed what I couldn't at the time. I highly recommend this book to anyone who knows someone with Chiari, it may help you understand the daily struggles of living with it and not wanting it to control your life. This story is absolutely touching. Renee has gone a step above creating a beautiful story. She has shared a piece of her life with all of us that would be hard for others to do. Renee takes us on Brenna's emotional journey. As you read you can feel Brenna's fear of not knowing what is going to happen. Renee expressed the uncondi This story is absolutely touching. Renee has gone a step above creating a beautiful story. She has shared a piece of her life with all of us that would be hard for others to do. Renee takes us on Brenna's emotional journey. As you read you can feel Brenna's fear of not knowing what is going to happen. Renee expressed the unconditional love and support of Brenna's husband Nick, her family and her friends. Renee this book is beautiful. Full of love, hope, and commitment! I am lucky to say that I know Renee through Facebook. she has talked a couple of times about Chiari openly, but I never imagined how difficult it really was. this may be a book that is categorised as fiction, but the struggle and pain behind it is real. Strength and love is never ending in the book. It's one book that makes you think over life and stop complaining about the things you don't have. You learn to appreciate what you do have. Reading it is a one in a lifetime experience, when I know I am lucky to say that I know Renee through Facebook. she has talked a couple of times about Chiari openly, but I never imagined how difficult it really was. this may be a book that is categorised as fiction, but the struggle and pain behind it is real. Strength and love is never ending in the book. It's one book that makes you think over life and stop complaining about the things you don't have. You learn to appreciate what you do have. Reading it is a one in a lifetime experience, when I know those are real events and real struggles. This book touched me as few have.. I felt as if I was sitting down with a close friend as she was sharing her story, struggles, and experiences. Very moving book! Beautiful in it's entirety and full of love. Amazing job, Renee! This book will stay with me and I will keep you in my prayers!! I highly recommend this to everyone! what a wonderful story! Love how this book does the point of view from the wife and husbands sides. This story is about how a family has to deal with chiari. Its a struggle to be dealt these cards but the wife Brenna is the strongest person I know. went through 3 surgeries still have pain from time to time some days weak pain other days hard to handle but Brenna handles. I've cried and I laughed. I highly recommend this book. It is based on true events. When exchanging wedding vows, no one really wants to be put to the test of loving someone through a sickness. Unfortunately, Brenna and Nick face this challenge. What unfolds is a beautiful example of unconditional love. Even through ups and downs, and endless amounts of guilt on both of their parts, Nick and Brenna always find each other. The fact that this story is based on the authors own journey with Chiari just enhances the reading experience.